You may occasionally want to solicit feedback from your users in a way that doesn’t annoy the crap out of them. The easier you make it for the people that use your site, the more feedback you will get. That’s where Usernoise Modal Feedback comes in. Usernoise will add a button to all of your pages labeled “Feedback.” The button will open a modal box with a feedback from inside. It’s that simple. Usernoise works on mobile devices and its design is responsive. It also comes with options to customize the look and feel of the modal box and the content of the form, but fundamentally the form is just for feedback, so you don’t have a ton of control over text fields. And it does this all with a very low-performance footprint, as only a small piece of HTML is injected and it utilizes WordPress’s built-in AJAX functionality to create the modal box. Upon activation, Usernoise will be disabled by default, but you will be directed to the Usernoise settings page. The very first option is “Enable Usernoise.” Check this box to get started. Once Usernoise is enabled you will see a button on each page that brings up the feedback form. By default, this button will be positioned on the left side of the page with the text “Feedback.” The form asks users to submit feedback in one of four categories, Idea, Question, Problem, and Praise. On the main settings page, there are a few more options to select which will enable or disable some basic features. The other tabs on the settings page allow you to customize the modal box and the form elements. The Button tab can be used to change the color and look of the button on your website. Change the position of the button, the text, font, and color. The Form tab lets you change the content of the form. You can’t add new text fields, and you don’t have a lot of control over exactly what the contents of the form are, but it’s a plugin built for Feedback, and that’s exactly what it does. You can turn text fields on or off and change the text that’s displayed to the user after a form is submitted. Notifications just have one setting, you can either enable or disable them. If you do disable them, you will still be able to view any feedback you get in your admin panel. If you do enable them, all feedback will be sent to the admin email set up in your General Settings. 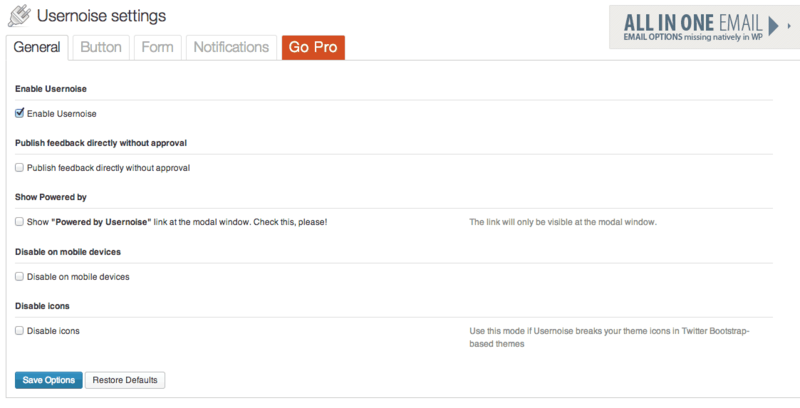 In the pro version, you can enable public feedback notifications, but it’s not available in the free version. By default, Usernoise will place a button on your site automatically. You can also embed the form on any page by using the shortcode [[usernoise]]. If you’d like to add a Usernoise button to your site, you can either upgrade and get access to the [[usernoise_link]] or [[usernoise_button]] shortcodes. Every time you receive feedback, it will be stored in the Usernoise tab in your admin panel, similar to how comments are saved in your WordPress install. You can either chose to Save the post or trash it. If you have the pro version, you can then display feedback publicly, but the free version will just keep everything saved privately. Usernoise is free to use, but there’s a Pro version as well. Don’t worry it’s not one of those plugins that won’t let you actually use it unless you pay. You’ll have full functionality with the free version, you just won’t have access to certain premium features, like advanced debugging, CSS customization and public feedback. Of course, it’s only $10 so if that’s something you’re interested in, it’s probably worth checking out. Nikolay keeps his plugin up to date, but support isn’t exactly easy to find. There are some handy FAQ’s on his Code Canyon page, but he provides direct support for paying customers only, which is only fair. Besides, I’ve never actually run into a problem, so that’s a good sing.